Since my pumpkin topiary a few years ago became a huge hit on Pinterest, I decided to do a new and more funky version this year. Black and Orange and FEATHERED!! 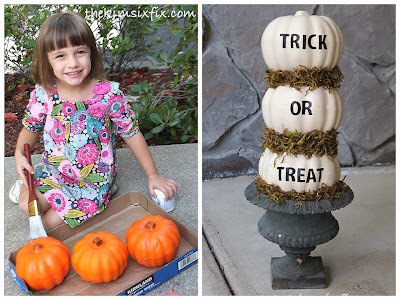 The process was really similar to the first topiary: I removed the stems from 2 of the 3 pumpkins and painted them with Rust-Oleum’s chalkboard paint. It took two coats to get them completely black. I added the pumpkins to an old cast iron urn I had, but I know you can buy inexpensive plastic versions that would work perfectly as well. I love the bright orange and black color combo. 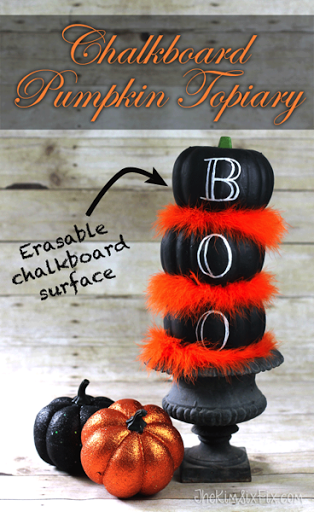 Another fun, inexpensive halloween dollar store craft.